Congratulations to the winners of the Youth and Adult categories! These were announced on 10 December 2013 by our experienced Jury, which was "impressed by the vibrant ideas and energy that came across in the articles and comments". 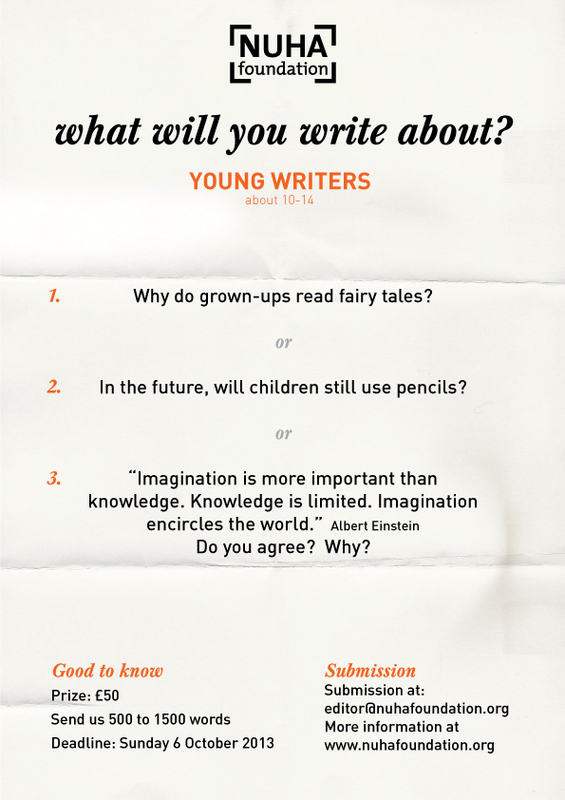 For the Young Writers category, it was decided that all five authors deserved recognition rather than to award a prize, and they will each be receiving a book! Cookie (France): Why Do Grown-Ups Read Fairy Tales? Arif, Nazish (India): To be or not to be - is that what school is about? Azizan, Nur Afiqah (Malaysia): "To be or not to be..." Is that what school is about? -- Shortlisted! Burgess, Hannah (UK): Myths, legends and fantasies: why do we read them, why do we watch them? 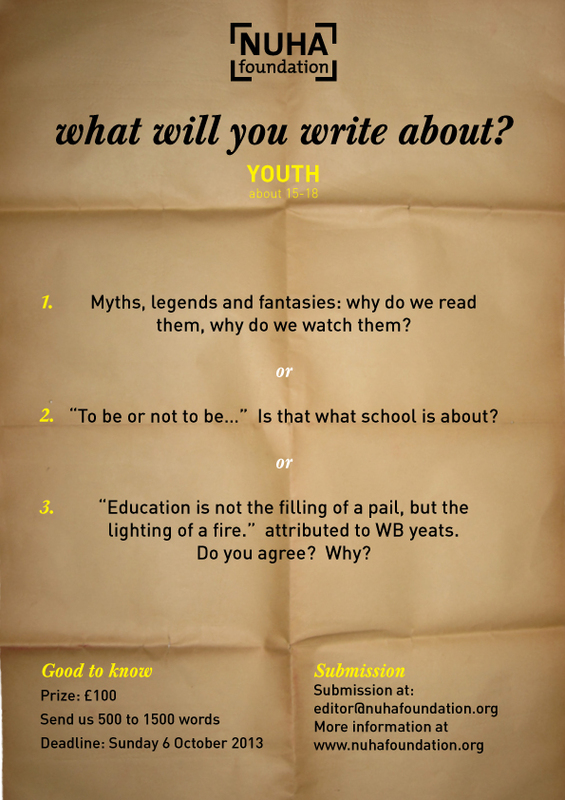 Hynes, Annabel (Ireland): Myths, legends and fantasies: why do we read them, why do we watch them? Lim, Seung Jae (Philippines): True Education is the Following of a Passion -- Winner of the NUHA Youth Blogging Prize 2013! Narula, Kritika (India): Fantasy and reality often overlap -- Shortlisted! Sulaiman, Kafayat (Nigeria): Myths, legends and fantasies: why do we read them, why do we watch them? 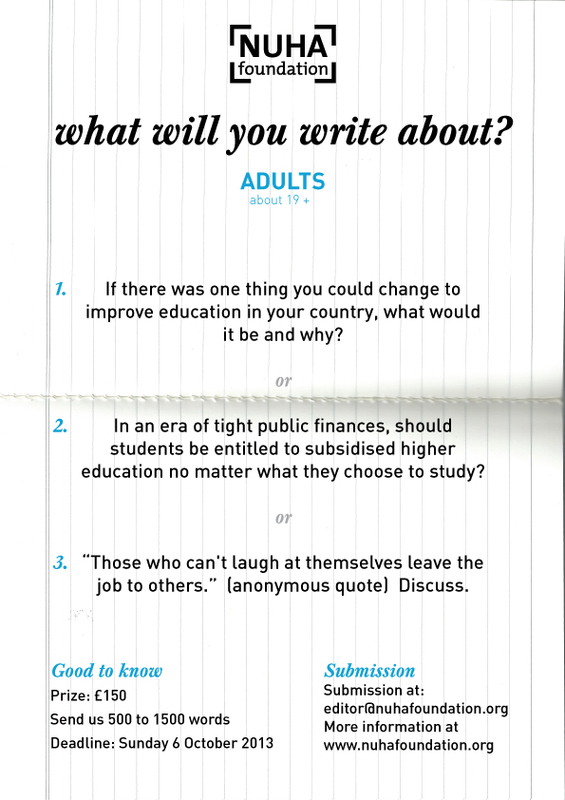 Anyata, Kingsley (Nigeria): The mindset -- 1st prize for the NUHA Adult Blogging Prize 2013! Boland, Helena (UK): If there was one thing you could change to improve education in your country... -- Shortlisted! Buhari-alade, Akintola (Nigeria): Yesterday's formula for success is often today's recipe for failure, our education system is archaic! Capariño, Joselito Narciso (Philippines): Investing in Philippine public education system: reforming the mindset -- Shortlisted! Clerkin, Anna Marie (Italy): "Those who can't laugh at themselves leave the job to others." Ghahremanzadeh, Reza (UK): "Those who can't laugh at themselves leave the job to others." Lee, Aurora (Brunei): In an era of tight public finances, should students be entitled to subsidized higher education no matter what they choose to study? Momanyi, Harun (Kenya): "An investment in knowledge pays the best interest" -- Shortlisted! Nayar, Megha (India): Tight public finances or otherwise, uniform subsidies are not the answer -- 2nd prize for the NUHA Adult Blogging Prize 2013! Obrah, Garima (India): Are we churning intelligence? Ogbe, Chukwunonso (Nigeria): Checkmating the Malaise of Intellectual Indolence in the Nigerian Educational Sector -- Shortlisted! Onwumere, Odimegwu (Nigeria): If there was one thing I could change to improve education in my country... -- Shortlisted! Patel, Mangal (UK): In an era of tight public finances, should students be entitled to subsidised higher education no matter what they choose to study? Raif, Ejder (UK): What would I change about education? Sutanto, Andri Kurniawan (Indonesia): Subsidies for higher education: should or not? Yap, Hui Rei (Singapore): "Those who can't laugh at themselves leave the job to others."